On Dmitri Mendeleev’s 1869 periodic table, element 21 appeared as “ekaboron”. No such element had yet been discovered, but Mendeleev’s predictions regarding its existence and properties were largely confirmed ten years later when Lars Fredrik Nilson detected it in the minerals euxenite and gadolinite, and named it scandium after his native Scandinavia. Nilson was able to prepare high purity scandium oxide, but pure scandium metal was not produced in significant quantities until 1960. The relatively short history of scandium production has limited its uses in industry, which in turn has kept production relatively low and prices relatively high. In absolute terms, however, scandium is not rare, and therefore increasing recognition of scandium’s benefits may eventually lead to expanded demand and production. Scandium is often used in small quantities to stabilize or impart useful properties to a host material, a practice known as doping. Most commonly, it is found in scandium-aluminum alloys, which are prized for their combination of lightness and strength, but are used less frequently than comparable less-expensive titanium-aluminum alloys. These alloys are used for some aircraft components and in sports equipment such as baseball bats, bicycle frames, and lacrosse sticks. Garnets containing scandium are used as gain media in lasers, including those used in dental surgery, and scandium-stabilized zirconia has been recognized as a high-efficiency electrolyte in solid oxide fuel cells. Finally, scandium oxide is used in metal-halide lamps that are used to produce high-intensity white light that resembles sunlight. Scandium is a metal that has many of the characteristics of the rare earth elements, particularly yttrium. It is a light material with a higher melting point than aluminum, giving it uses in aerospace and other manufacturing, such as racing bicycles, baseball bats, and golf clubs. Doping zirconium oxide with scandium oxide produces a low temperature electrolyte for solid oxide fuel cells. Scandium is available as metal and compounds with purities from 99% to 99.999% (ACS grade to ultra-high purity). Elemental or metallic forms include pellets, rod, wire and granules for evaporation source material purposes. Scandium nanoparticles and nanopowders provide ultra-high surface area. Oxides are available in powder and dense pellet form for such uses as optical coating and thin film applications. Oxides tend to be insoluble. Fluorides are another insoluble form for uses in which oxygen is undesirable such as metallurgy, chemical and physical vapor deposition and in some optical coatings. Scandium is also available in soluble forms including chlorides, nitrates and acetates. These compounds can be manufactured as solutions at specified stoichiometries. Scandium is a Block D, Group 3, Period 4 element. The number of electrons in each of Scandium's shells is 2, 8, 9, 2 and its electronic configuration is [Ar] 3d1 4s2. The scandium atom has a radius of 160.6.pm and its Van der Waals radius is 200.pm. In its elemental form, CAS 7440-20-2, scandium has a silvery-white appearance. Scandium is found in concentrated amounts in the minerals euxenite, gadolinite and thortveitite; however, due to the difficulties in the preparation of metallic scandium, global trade of the pure metal is very limited. Scandium was first discovered by Lars Nilson in 1879. The origin of the name scandium comes from the Latin word 'scandia' meaning Scandinavia. Scandium information, including technical data, safety data, high purity properties, research, applications and other useful facts are discussed below. Scientific facts such as the atomic structure, ionization energy, abundance on earth, conductivity and thermal properties are also included. Scandium is mildly toxic in its elemental form. Safety data for Scandium and its compounds can vary widely depending on the form. For potential hazard information, toxicity, and road, sea and air transportation limitations, such as DOT Hazard Class, DOT Number, EU Number, NFPA Health rating and RTECS Class, please see the specific material or compound referenced in the Products tab. The below information applies to elemental (metallic) Scandium. Scandium has a low order of toxicity. As with calcium, the toxicity is generally a function of the anion. 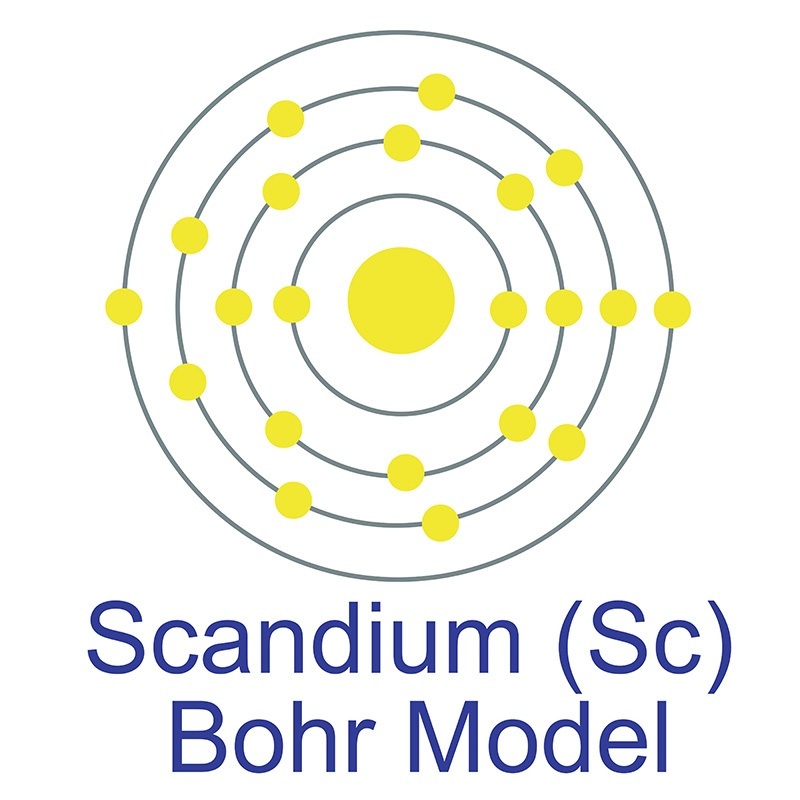 Scandium has one stable isotope: 45Sc.